Description: This single-trunked tree is typically 30-60' tall at maturity, forming a rounded pyramidal crown from a dense network of short crooked branches. On older trees, trunk bark is light gray, shallowly furrowed, and warty, otherwise it is light gray and more smooth. Branch bark is also light green and relatively smooth. The bark of both trunk and larger branches is often discolored from lichens. Twigs are gray or brown and smooth, while young shoots are light green to tan and either glabrous or hairy. Evergreen alternate leaves occur along the twigs and young shoots. The leaf blades are 2-4" long and ¾-2" across; they are broadly elliptic or ovate and shallowly lobed (pinnatifid). The lobes and tips of the leaf blades terminate in sharp spiny teeth. The upper blade surface is yellowish green or green and somewhat shiny, while the lower surface is more pale and dull; both sides of the blade are hairless. The texture of the leaf blades is stiff and leathery. The petioles are short, light green, and often pubescent. American Holly is dioecious, forming male (staminate) and female (pistillate) flowers on separate trees. Male trees produce axillary clusters of 3-12 male flowers on peduncles about 1" long. 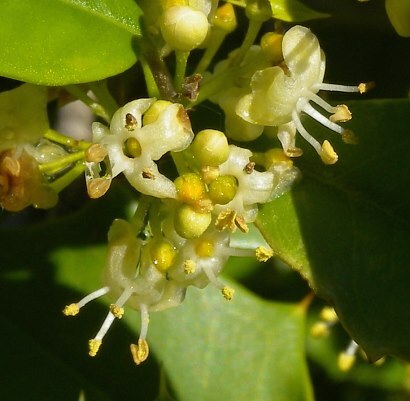 Individual male flowers are about ¼" across, consisting of a short green calyx with 4 lobes, 4 greenish white or yellowish white petals, and 4 stamens. Female trees produce female flowers individually or in groups of 2-3 (rarely more). Individual female flowers are about ¼" across, consisting of a short green calyx with 4 lobes, 4 greenish white or yellowish white petals, 4 residual stamens that are infertile, and a green pistil. The petals of both male and female flowers are oblong in shape. The peduncle and pedicels of the flowers are green and either hairless or sparsely pubescent. The blooming period occurs during late spring or early summer for about 3 weeks. Cross-pollination between a male tree and a female tree is required in order for the latter to set fruit. Fertile female flowers are replaced by drupes that become mature during the fall. Mature drupes are about 1/3" (8 mm.) across and either bright red or orange-red (rarely yellow). The fleshy interior of each drupe has a bitter taste. This tree spreads by reseeding itself. Cultivation: The preference is light shade to full sun, moist to mesic well-drained conditions, and a somewhat acidic soil. American Holly adapts to soil containing sand, rocky material, or loam. Flowers and fruits can be produced in less than 10 years. This tree grows slowly and can live up to 150 years. Individual evergreen leaves persist on a tree for about 3 years before they are replaced. Severe winter cold can cause die-back of branches and twigs. Sometimes the leaves are damaged by leaf-spot fungi and various kinds of mildew. Range & Habitat: The native American Holly is a rare tree in Illinois, occurring in only a single county in southern Illinois (see Distribution Map). This tree is more common in southeastern United States, particularly in sandy areas along the Atlantic coast. 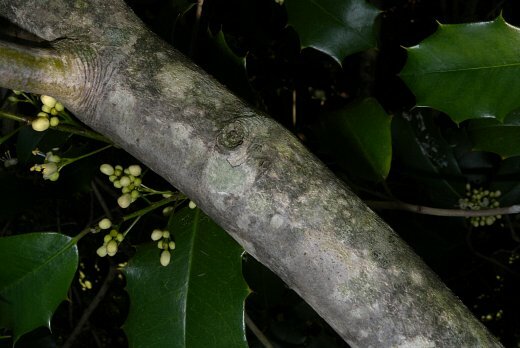 In Illinois, American Holly has been found along a rocky wooded slope. Outside of the state, it occurs in such habitats as well-drained areas of bottomland woodlands, rocky upland woodlands, and sandy savannas. These wooded areas often contain both coniferous trees (primarily southern pines) and deciduous trees (oaks and miscellaneous others). Because of its slow growth and tolerance of shade, American Holly is often an understory tree in these habitats. Because of its thin bark, it is easily killed by wildfires. Because of its ornamental qualities, American Holly is often cultivated as a small- to medium-sized landscape tree. Faunal Associations: The nectar and pollen of the flowers attract various insects, including bees, wasps, ants, flies, and moths. While this tree was being photographed in an urban park, the author of this website observed Spring Azure butterflies (Celastrina argiolus) sucking nectar from the flowers. Other insects feed more destructively on American Holly. These species include caterpillars of the moth Metaxaglaea violacea (Holly Sallow), the fly larvae of Phytomyza ilicicola (Native Holly Leafminer) and Phytomyza ilicis (Holly Leafminer), the fruit-eating larvae of Asphondylia ilicicola (Holly Midge), and Asterolecanium puteanum (Holly Pit Scale). An arachnid invertebrate, Oligonychus ilicis (Southern Red Mite), also feeds on American Holly, damaging the leaves and twigs. The colorful and somewhat bitter fruit of American Holly is consumed primarily by birds and, to a lesser extent, by some mammals. Birds that eat the fruits include the Wild Turkey, Bobwhite, Northern Flicker, Northern Mockingbird, and Cedar Waxwing; the Bird Table provides a more complete listing of these species. Mammals that feed on the fruits include the Raccoon, Striped Skunk, Fox Squirrel, Gray Squirrel, and White-Footed Mouse. Because of their low palatability and mild toxicity, the leafy branches are not preferred as a food source by mammalian herbivores. However, when little else is available, White-Tailed Deer and domesticated cattle occasionally browse on them. Photographic Location: Crystal Lake Park in Urbana, Illinois. Comments: American Holly is an interesting tree with attractive foliage and fruit. Among evergreen broad-leaved trees, it is the most cold-hardy in North America and can be grown north of its native range (if appropriate cultivars are selected). Because of saponins and the bitter compound ilicin, the fruit is not palatable to humans. 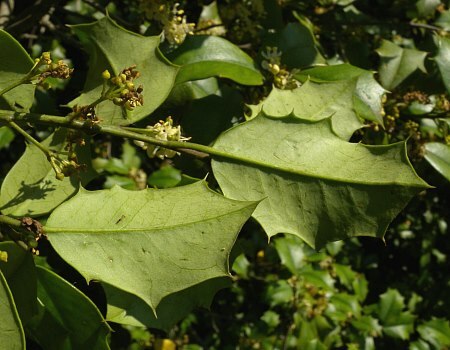 Other species of the Holly family in Illinois are deciduous-leaved shrubs that do not attain the tree-like stature of American Holly; their deciduous leaves are neither leathery nor spiny. A non-native species, Ilex aquifolium (English Holly) does resemble American Holly, except it is somewhat smaller in size and its evergreen leaves and fruit are more shiny. 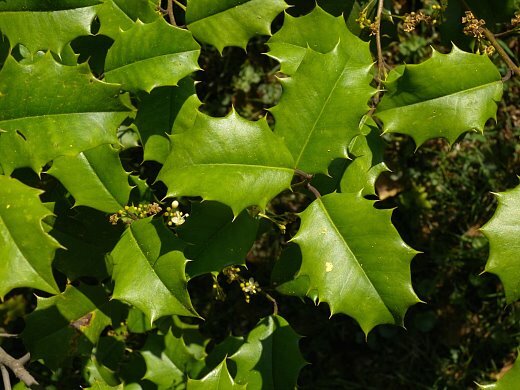 While English Holly is occasionally cultivated, it does not adapt well to a continental climate and it apparently has not naturalized within the state.